This past spring my husband and I took a road trip to SE Colorado to visit The Great Sand Dunes National Park--click here to read that post--and we decided to visit two National Historical sites on our way back home. One was of these sites was the Sand Creek Massacre National Historic Site located in Kiowa County, near Eads, on the great high plains of Colorado. This site is sacred, controversial, symbolic and a reminder of a national tragedy that happened on November 29, 1864. I was profoundly touched by what I read and saw at this site, and although it is a difficult subject, I thought it would be fitting to show what we saw on the 152 year anniversary as well as to wonder what has the United States learned from its past? Our drive was very long. The high plains of Colorado are very vast and very desolate in many areas. The remoteness of the Sand Creek location made me wonder even more why this event happened so long ago. We passed through dry prairie grasslands, by ranches, and some farms before we passed by the desolate ghost town of Chivington. This was a landmark that the Sand Creek Massacre site was close by. When we passed through the gate there was still some drive ahead, with only a few trees visible a small visitor center and some placards describing what happened here. My husband and I and one other man were the only visitors at the time, but a ranger came to meet us to tell us the history of the area and direct us towards the massacre site. Along the Big Sandy Creek, about 700 Cheyenne and Arapaho native people were living peacefully at a winter camp in what was then Colorado territory. They believed they were under the protection of the US Army by treaty. Many of the men were away hunting for food, so the camp consisted of mainly old people, women, and children. At dawn on November 29, 1864, approximately 675 U.S. volunteer soldiers, commanded by Colonel John M. Chivington, attacked the sleeping natives with guns and cannons. Black Kettle, one of the peace Chiefs, raised an American flag and white truce flag above his tipi, as he had been promised protection, but he also had to flee. While many managed to escape, about 200 women and children, and the elderly struggled to run in the sandy earth of the dry creek bed. Some women tried to dig trenches in the creek bed, or in the hollow logs of cottonwood trees to hide their children, but most were mercilessly slaughtered during the eight hours of fighting. During the afternoon, and the next day, the soldiers wandered over the field committing atrocities on the dead, taking native belongings as souvenirs, and burning down the encampment, before departing the scene on December 1, to resume campaigning. A placard on the site explains the events of the massacre. For many years the Arapaho and Cheyenne people had lived their way of life on the plains of Colorado, but the discovery of gold in 1858 brought many prospectors and then many settlers into the Colorado territory, increasing conflicts and clashes with the natives. Territorial Governor John Evans wished to apply for statehood and felt the eradication of "hostile natives" would ensure the safety of the new citizens. Sadly, many at the time felt the natives were soulless savages not worthy of the same rights as Christians. Chiefs Black Kettle and Left Hand pleaded for peace and an end to violence and were promised this just a couple months before at a counsel in Denver, with Governor Evans, Colonel Chivington, Major Wynkoop, Captain Soule, and other officials. They were told to surrender at Fort Lyons. Prisoner rations were not enough to sustain them at the fort, so they moved further east to the Sand Creek area where they knew they could hunt for food. Captain Silas S. Soule, and Lieutenant Joseph A Cramer, who knew these people had been promised peace, put their military careers and lives at danger by refusing to fire on the peaceful encampment of Cheyenne and Arapaho at Sand Creek on November 29. They wrote letters to their former commander Major Edward Wynkoop, describing the horrible atrocities they witnessed. These letters led to an investigation by two congressional committees, and an army commission, which changed history's judgment of Sand Creek from a battle to a massacre of men, women, and children, but charges were never brought against those responsible. Sadly, Captain Soule was murdered soon after he testified to the commissions. A placard at the Sand Creek site shows the letter Captain Soule wrote to Major Wynkoop graphically describing the atrocities of the massacre. For a long time, these letters were displaced but copies resurfaced around the year 2000 to help convince the U.S. Congress to pass legislation to establish the Sand Creek Massacre site as a National Historical site. You can read the full letter on this government website--click here--scroll down the page. Be warned they are horribly graphic in description. Today the park preserves approximately 2,400 acres of the massacre site. The actual creek site is restricted to visitors. Native Cottonwood trees line the creek where tipi once stood. The Sand Creek Massacre is one of the most disgraceful events in American history--a tragedy reflective of its time and place. As time has marched on, most Americans realize the injustices done to our country's native people, who were trying to protect their way of life from change and destruction. Every year, for the last 18 years, there has been a Spiritual Healing Walk Run Event that is sponsored by the Northern Cheyenne Tribe of Montana, the Northern Arapaho Tribe of Wyoming, and the Southern Cheyenne and Arapaho Tribes (Oklahoma) to honor the victims and survivors of the Sand Creek Massacre and for healing of ancestral homelands. 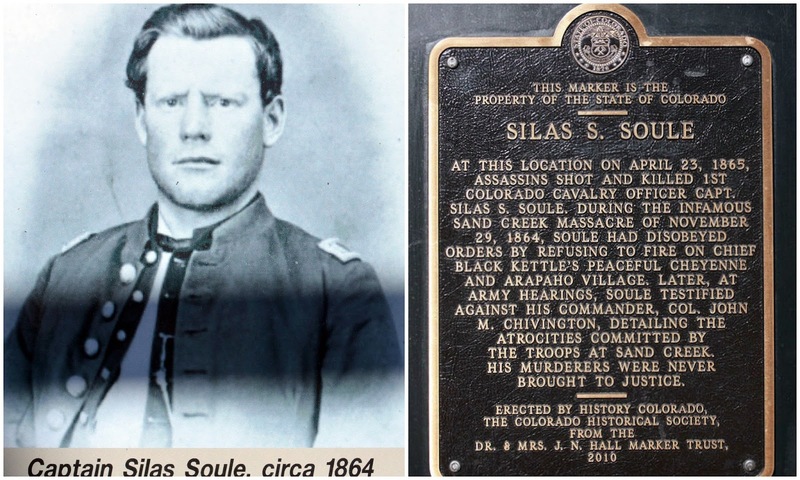 They run/walk from the Sand Creek Massacre site to Denver over four days, stopping at the memorial plaque for Silas S. Soule located at 15th and Arapaho Ave, in Denver and then walk a mile on to the Colorado State Capital Building for a ceremony. To watch a video about the Sand Creek Massacre, presented by Rocky Mountain PBS, click on the arrow above or go to this link: YouTube Sand Creek Massacre. The National Parks Service also has a video about the Sand Creek Massacre Site dedication as a National Historic landmark on this YouTube video link. 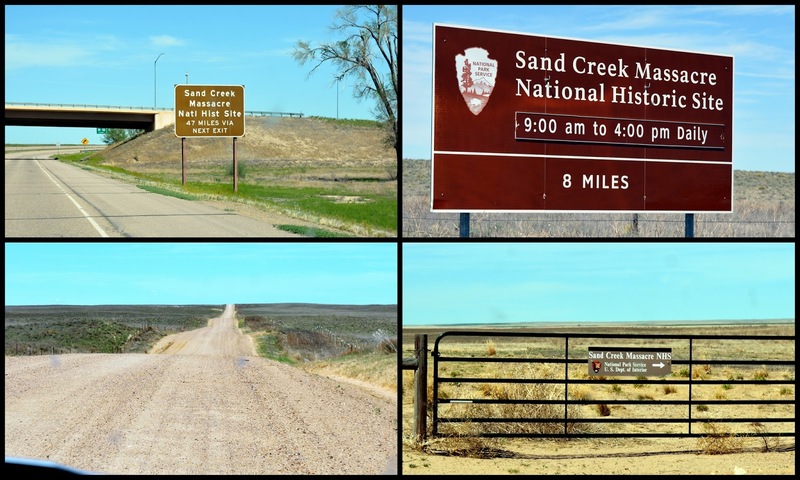 As my husband and I drove the 180 miles or so back home to the Denver area, we thought about the sad events that took place 152 years ago at Sand Creek. Unfortunately, events such as this continue to occur in the world and probably will continue in the future as long as humans judge each other by race, nationality, and creed. There are many lessons to be learned if we hope to see hatred end and peace come to our world. Can we ever hope to see that day?